Aruba's attractive beaches and top-notch clear-water dive spots are globally celebrated. It is Aruba's most famous and developed beach. The Palm Beach is flanked by hi-rise hotels plus numeours seaside bars, clubs, and restaurants - creating a pulsing atmosphere. Tranquility seekers need not despair. 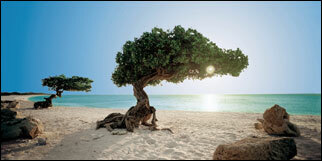 Aruba is famous for its beautiful white-sand beaches - and some are secluded. This city is Aruba's capital and tourism center. Some of its buildings have picturesque classic Dutch (and other European architectural designs). The most tourist-photographed architecture is on Klip Street. But some of its facades may seem garishly hued to sophisticated eyes. It was once one of Aruba's most renowned attractions. Sadly, this natural seaside bridge collapsed in 2005. The good news is Aruba has scant rains and lies south of the traditional hurricane routes. On the other side of the coin, light rainfall means Aruba lacks some of the tropical lushness found on most other Caribbean Islands. Authority and is used with permission.